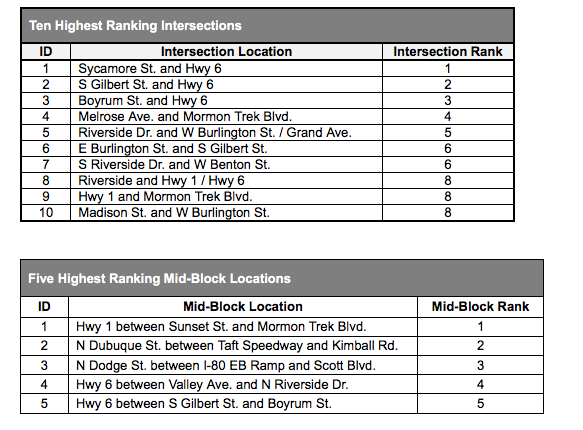 This information identifies high collision locations in Iowa City for the years 2015 through 2017. The data used in this report was sourced from the Iowa Department of Transportation (Iowa DOT). The Iowa DOT obtains copies of collision reports from local jurisdictions to compile a database called the Iowa Crash Analysis Tool. Current data can be found on the IDOT's website. This information was compiled by the Metropolitan Planning Organization of Johnson County (MPOJC) Transportation Planning Division. Please contact Kent Ralston at 319-356-5253 for more information or questions concerning this data.